Neon Ball is a simple game where you must rotate the playing field to roll the bal to the exit. Because it is so simple it is very easy and fun to play. 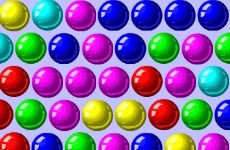 Neon Ball haves 18 challenging levels. Each level becoming more difficult then the previous. You can get 3 stars per level. Score at least a few stars to continue to the next level. Tap or click left or right to move the field, gravity will do the rest. Collect all 3 stars and move to the portal to finish the levels in Neon Ball.